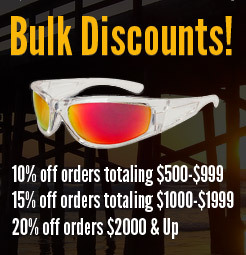 Sunglass Displays & Accessories ~ Good Business Sense - CTS Wholesale LLC. Retailing sunglasses is a very lucrative endeavor however some might think it to be as simple as placing a few styles on a counter and waiting for someone to notice them. Occasionally perhaps it is that simple, but to be successful as a sunglass retailer, there are a few key concepts that will increase overall sales. First, and most obviously; provide potential customers with the latest in fashion trends and remember; the better the selection the better the odds are of selling! A nice touch is to offer sunglass styles that are universal or unisex, such as aviators or classics. Appeal to as many potential customers as possible. Third, everyone knows that when you're choosing a pair of sunglasses, the FIRST thing you seek is a mirror! So, wouldn't it be a wonderful finishing touch to provide an attractive swivel mirror? Now CTS offers a very nice looking counter top mirror with a swivel base. Our new mirror features dual mirrors; one side standard, and one side magnified. It measures 9" wide by 13.5" high, and is only $25. Increase sales with a few simple steps, and make even better profits! Visit our Sunglass Displays & Accessories category to find what works for your location. We have many different displays so you will find just what you need. Our accessories selection is full of practical and useful accessories that are all priced at wholesale, so you will be able to make a nice profit while appealing to a larger customer base.